After a little late start this morning, Amber and I were on our way. We’ve been on various sections of 66 from Chicago to Romeoville several times since moving here, but this would be Amber’s first trip on Route 66 south since our first trip on vacation in August 2000. We had with us an excellent book, written by John Weiss – The New, Historic Route 66 in Illinois. It’s an excellent resource, not only for Route 66, but side trips too. We were heading to southern Illinois to Hamel, where there is an old barn with a Meramec Caverns ad painted on it. I read a post on the Route 66 mailing list made by Shellee Graham that the Route 66 Association of Illinois was planning on restoring it this weekend. So I contacted both Jeff LaFollette, the president of the Association and John Weiss, the Chairman of the Preservation Committee about our interest in helping with the restoration. They both indicated our help would be welcomed, so we were off to help restore a piece of Route 66 history! We started our journey from Romeoville and went through Joliet, Elwood and Wilmington. We hadn’t had breakfast, and it was still a little early for lunch food. But since the Launching Pad was open, we decided to stop. We ordered our food from the drive-thru and continued south. I showed Amber the old concrete road leading up to the old bridge in Gardner, and we went through Dwight and Odell. It was interesting to see the Odell station, because it was restored by the Preservation Committee also. On our first trip on August 12, 2000, there was a Poker Run held there, attended by many of the same people we would be meeting down at the barn this weekend! We followed the Route through Pontiac (I am convinced we’ll never get through Pontiac without getting mixed up!! LOL), Chenoa, Lexington, Towanda, Normal and Bloomington. 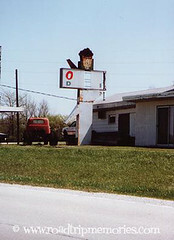 In Lexington, we went by what was the Oasis Drive-In (picture, right). Then it was on to Funks Grove! We stopped by the old train depot and the antique store. Amber was fascinated with it…it reminded her of “Whistle Stop” from Fried Green Tomatoes, which she had just seen. We then went over to Funks Grove Maple Sirup, of course! It wasn’t as quiet here today as when Pat and I were here two weeks ago, there was a bus trip of tourists. Among our souvenirs, I bought the Route 66 music tape, an antenna ball, and more maple candy (yum!). Amber bought a Funks Grove t-shirt and some post cards. We stopped at the Dixie to see the Hall of Fame, so I could show Amber what the Oasis Drive-In used to look like (they are a member of the Hall of Fame). We went through Atlanta again, and in Lincoln, where I showed Amber The Tropics Restaurant, where Pat and I ate two weeks ago. Cool sign! 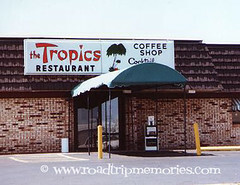 Below are two pictures of The Tropics Restaurant today, and on the bottom is an old postcard Pat has of it. In Springfield, we traveled on the 1930 – 1940 alignment, whereas the first time we had followed the 1926 – 1930 alignment. I wanted to take Amber to the Cozy Drive-In for corn dogs this time! South of Springfield, I took Amber on the 1930 – 1940 alignment, but then I realized that she hadn’t really seen the 1926 – 1930 alignment either! By the time we left Springfield on our first trip, went out on that “side trip” to New Berlin, and returned to Springfield, it was late and Amber had fallen asleep. She woke up when we arrived in Hamel at the Innkeeper Motel. So next time we might take that alignment again, so she can see Carlinville and the other towns. We went through Farmersville and Waggoner, then Raymond, past the Our Lady of the Highways shrine at Francis Marten’s farm. We doubled back to find Pat’s mystery slab, which was only a short distance to the north. Pat would come out tomorrow to investigate, but was disappointed to find it was not an alignment. At the Holiday Inn of Carlinville, we saw the paddle boat as shown in John Weiss’ book. We went through one of the alignments in Litchfield, and into Mount Olive and by Soulsby’s Shell Service Station. In Staunton, we went by Rich Henry’s and onto Hamel. We went by the Meramec Caverns barn, but everyone must have left for the day. The front was painted black, and the side facing the road was red. It was too early to check into the motel, so I thought Amber might like to head into St. Louis and – where else – go to Ted Drewe’s for a concrete! We continued through Hamel and into Edwardsville. When we got to the A & W, Amber too, was upset to see it ready to be torn down (not sure about that, but it seems highly likely). We continued down into Mitchell and by the Hen House, where we ate breakfast the first time. We drove into the parking lot where Pat got us stuck last time! The “trench” he left is still there! LOL We took the Interstate over the Mississippi River and into St. Louis and on to Ted Drewe’s. After that, we went over to where the Coral Court once stood. Thanks to Pat, he pointed out the location of the Coral Court to me on our trip two weeks ago. I observed from this trip that it is easy to get confused about the Coral Court’s location because there are many curved, slate entranceways in the area that look like the ones at the Coral Court. But this time we got it right! We headed back up to Staunton, where we were going to spend the night. I’m still not used to the open farmland, so seeing the sunset was very pretty down here. This entry was posted by Jennifer on April 28, 2001 at 3:06 pm, and is filed under Road Trips. Follow any responses to this post through RSS 2.0.You can leave a response or trackback from your own site.